The true art of apologizing is in understanding that what makes an apology effective is not just the words that are written or spoken, but how those words are delivered. Apologizing is both an Art and a Science. The Science, is the list of ingredients that when combined will form the perfect apology. The Art, on the other hand, deals with the surrounding elements, that make an apology more relevant, effective and ultimately successful. For an apology to be successful, you need to consider the recipient and your relationship. The personality of the recipient (his/her likes, dislikes, values, personal preferences) as well as the relationship you have. These should affect the format, style, and content of your apology. So although every apology should include the same ingredients, the level of playfulness, formality, or romance you bring to it should be dictated by the recipient, the relationship that you have with them, and the nature of the infraction. Always keep in mind when apologizing that content (what words to use) and style should be based on the recipient and your relationship, while the tone of your apology should be based on the infraction. As a general rule, the more serious the infraction the more serious the tone. WARNING: Always err on the side of assuming that the person who has been hurt views the infraction as more serious than you do. There is nothing less effective when apologizing than making light of the situation in the eyes of the recipient. Now let's take a look at two of the more common personal relationships where the Art of apologizing comes into play. Good friends: Apologies between friends should reflect the friendship. For life-long friends, draw on something in your history together that shows how important the friendship is to you and how sorry you are for putting it at risk. If the infraction is serious, make sure that your apology reflects that you understand the severity of what you've done—use more formal language and an appropriate setting. A token gesture or gift between close friends can be very effective in demonstrating how much you've thought about the situation, especially if the gift is tailored to the recipient or your friendship. 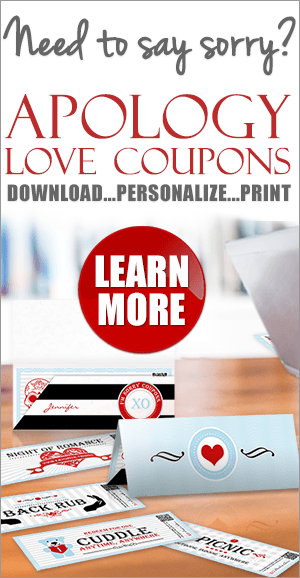 Romantic Relationships: Whether girlfriend or boyfriend, lovers or a spouse, think about including a romantic poem, quotes on apologizing, the lyrics from a favorite song, or even some flowers. Just like with good friends, bringing an element that reflects on your history together shows how important the relationship is to you. Be creative. Is there something special that they've wanted or hinted about? Is there something out of character for you to offer them as a gift that shows how sorry you are and that you've really tried to make amends? WARNING: Offering a thoughtless random gift will more often than not reflect poorly on your sincerity. After all, if you haven't taken the time to find something special then how important can the relationship be to you? If you can't come up with something that's relevant or desired by the recipient go with something corny—flowers, candy, or even a customized T-Shirt that says 'I'm Sorry'—corny can work well as a token gesture in romantic relationships. Making an apology more thoughtful by tailoring it to the recipient and the situation is an essential component of all perfect apologies. The only limit is your imagination. As long as you include all of the elements outlined in the Science of an apology you can add whatever personal touch you feel appropriate to make the recipient understand how very sorry you are and that your relationship is important. 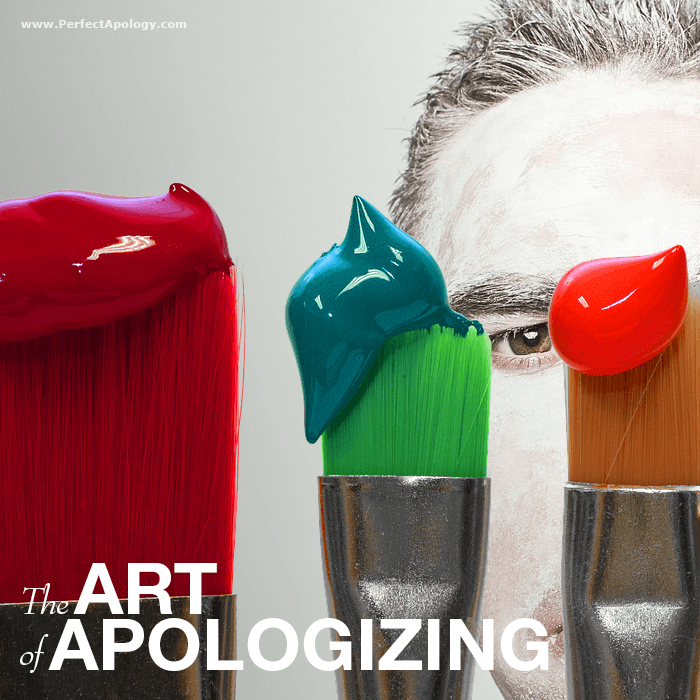 Now that you've figured out the style and content of your apology, the next step in the Art of apologizing is to think about how you present and deliver it. There are two basic approaches for presentation and delivery—saying I'm sorry with a verbal apology and writing an apology letter. Each format has its own drawbacks and benefits. The most important things to keep in mind are that a letter of apology gives the recipient something tangible to hold and the time to think over what you've written (and cool down, if necessary). While a verbal apology requires that your sincerity shines through and that you're prepared for whatever reaction and course the discussion takes, regardless of a positive or negative outcome. Still not sure what you need to include when saying sorry? Here's the Science or list of ingredients to include when apologizing.